Sage50 Specialists Allan Noble have been working with Sage Accounting and Payroll software for over 25 years. In that time we have become expert in all areas of Sage50 (aka Sage Line 50) software provision and can honestly say that we have an enviable reputation in ensuring our clients have only the best in service from us. If you need convincing please see our testimonials page. Based in leafy Belbroughton, Worcestershire, close to the M5 and M42, the company is ideally placed to offer Sage50 training and Sage50 support for any business that is based in and around the West Midlands, Shropshire, Herefordshire, Worcestershire, Birmingham, Warwickshire, Staffordshire and The Black Country. 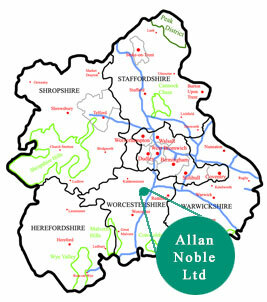 For clients outside these areas Allan Noble offers remote support using screen sharing software. The map below shows our area of normal coverage. Remember if it is an experienced company you need to help you with Sage software then Allan Noble Ltd is the one to choose. Our Sage50 support is available completely tailored to your own company's needs. From one hour a month to many days of on site help, we can provide you with a professional service that can really make a difference in your Sage50 knowledge, ability and results. Sage50 Training - on site, in the area shown. Sage50 Training - remotely, anywhere in the UK. Sage50 Support - on site, in the area shown. Sage50 Support - remotely, anywhere in the UK. Sage Payroll Training - on site, in the area shown. Sage Payroll Training - remotely, anywhere in the UK. Sage Payroll Support - on site, in the area shown. Sage Payroll Support - remotely, anywhere in the UK. If there is anything that you wish to know about how we can help you. simply get in touch and we will be happy to advise.